Dragon Fire Boxing are delighted to announce the signing of 21 year old sensation Jackson England. The Mandurah based Jackson will return to the ring on the Dragon Fire Boxing renowned “Thunderdome” show in Perth on March 8, as he takes on 72 fight veteran Rivo Rengkung, who’s last opponent was World title challenger Luke Jackson. 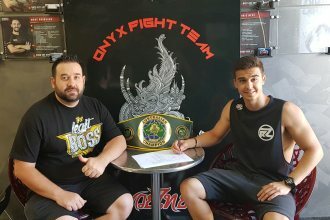 The current 21 year old ANBF Champion opened up about signing with Dragon Fire Boxing and his upcoming bout. England is based out of Perth’s heralded Onyx Fight Team camp. The two time amateur champion described what effect the link up with the Onyx Team has had on his career. Stablemate “The Timorese Terror” Steve Gago will be on the card also as a tune up to his IBF Silk Roads Tournament Final at the IBF Convention in June in Macao. England stated, “Training with the Onyx Fight Team with Jay Gray and the rest of the team is the best training I’ve ever had and that will show on March 8 when I put on the best performance of my career.